We can't put our finger on it, but for some reason, this Xenium K700 from Philips -- rumored last month and pictured here in clean press shots for the first time -- doesn't really scream "phone" to us. PMP we could see, possibly a low-end point and shoot camera, but not so much "I'm planning on holding this to my face and talking." Maybe it's the recessed lip below the screen? Anyhow, this should be an interesting one for anybody looking to eke a month of standby out of a full touchscreen phone, and the WQVGA resolution, 3.2 megapixel cam, and dedicated GPU are all pretty nice, too. 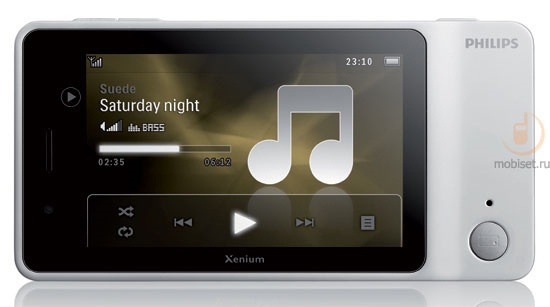 What's amazing is that the incredible power management (a Xenium hallmark) comes from a mere 1,000mAh battery, but part of the explanation comes from the weaksauce triband EDGE radio. When are you gonna do up some global HSPA phones, guys? Philips' Xenium K700 doesn't look much like a phone originally appeared on Engadget Mobile on Thu, 24 Sep 2009 14:29:00 EST. Please see our terms for use of feeds.